Roller Burnishing Tool is a processing tool with cold extrusion and plastic. Its purpose is to reduce the surface roughness of the metal workpiece, improve the surface finish while increasing the hardness and fatigue resistance of the product, and enhancing the product’s resistance to pressure wear and corrosion, and then increasing service life, the result is so much reduced industrial processing and production costs. Due to the popularization of the automobile industry, the hydraulic cylinder industry continues to develop. The service life of the hydraulic cylinder depends on smooth finish of inner surface and impact wear. Usually, we use the original processes of grinding and honing to polish the surface and inner wall of the cylinder, however, with a large quantity and high process requirements, the original process is far from meeting the requirements for polishing the inner bore of the hydraulic cylinder. 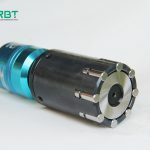 Today, we will introduce the technology of roller burnishing tool on the mirror surface of the hydraulic cylinder. Roller Burnishing Tool is a multi-cone column adjustable structure cutter. It consists of the following components: Spacer, Tapered roller, Support sleeve, Cone sleeve, Outer casing, Adjustment sleeve, Mandrel, Support pin, Pole pin, Round nut, Type-J Bearing, Support pin. The material of tapered roller and cone sleeve should be selected GCr15 bearing steel, heat treatment hardness is from HRC63 to 65, working surface roughness is from Ra0.1 to 0.05um, and the heat treatment hardness of Support pin is from HRC55 to 60. The rang of magnitude of interference determines the rolling-force strong or weak, rolling-force increases with increasing as the amount of magnitude of interference, how to select the magnitude of interference is very important, not only consider that the original surface is ironed by plastic deformation, but also consider the change of cylinder diameter. If the purpose for reduce the roughness, the value of magnitude of interference can choose a smaller, but keep in mind, do not exceed the ironed value, control the value of magnitude of interference means which is to control the rolling-force. As an example in processing φ125 cylinder, selecting magnitude of interference is from 0.15 to 0.18 that is advisable. The rolling feed speed will affect the process result, but it mainly affects the production efficiency. Increasing the rolling feed speed will improve production efficiency; however, the selection of the rolling feed speed should consider the rigidity and vibration of the machine, as well as the wear and frictional heat of the rolling parts. Excessive rolling feed speed will It will exacerbate the deformation of cylinder, and increasing the vibration of the machine and decrease service life of rolling parts. Practical application experience shows that the rolling speed range is from 1 to 1.5m/s. During roll processing, the feed rate will directly affects the surface polishing quality and production efficiency of the cylinder. Under better working conditions, the feed rate will more than self-feed rate about 10; otherwise, the original surface quality is poor, should adopt feed rate of 8=1.5 to 2.5 mm/r. It is advisable to use rolling cone for processing S45C cylinders. Before rolling process, cylinder should be bored to basic size, surface roughness keeps from Ra6.3 to 3.2μm which is more economical and reasonable. The rolled magnitude of interference is recommended to be from 0.15 to 0.18mm. Processing φ63H8 of long cylinder, recommended rolling process parameters: V = 1.5 ~ 2m; feed rate: S = 1.5 ~ 2.5mm. In summary, we understand that roller burnishing tool has the advantages of easy installation, quick use, simple operation, and high efficiency, which greatly shorten the production cycle, reduce the conditions for processing configuration, and reduce production cost. At the same time, the roller burnishing tool can improve the service life and working without cutting plastic. In addition, the roller burnishing tool can be used for different machines. 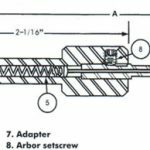 ← The structure and characteristics of double rod roller burnishing tool.